The Luther Burbank Center for the Arts in Santa Rosa. If you had tickets to a concert, theater performance or festival this weekend in Sonoma and Napa counties, chances are high that event will not happen. That's because, five days after several massive wildfires started burning through the region on Monday, Oct. 9, flames are still threatening communities and safety is priority number one. Many venues, event centers, museums and galleries were among the over 3,000 structures that have been lost or the countless more still at risk, and most have opted to delay, postpone or cancel events scheduled this weekend. 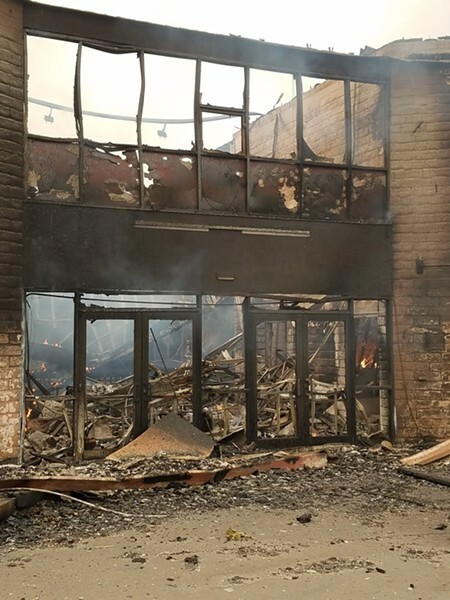 In Santa Rosa, the Luther Burbank Center for the Arts was severely burned in the initial firestorm, and while the main building seems largely intact, much of the campus was damaged and all performances and events are cancelled through Oct. 15. The center provided a statement that read in part, "Luther Burbank Center for the Arts has been a part of the North Bay community for more than three decades. We are devastated by the destruction in our community and will support our neighbors and their loved ones in any way we can. We hope to open our doors to our community soon." The Sonoma Laughfest was scheduled to happen at the Luther Burbank Center this weekend as part of its three-day festival this weekend, though now that fest has been cancelled. Organizer Brooke Tansley said many comedians were booked to stay at the Fountaingrove Inn, which was completely destroyed, and added, "We also don't want to bring our performers in from out of town who would take resources that need to be free for displaced locals." Santa Rosa's 6th St Playhouse has cancelled all classes and performances through the weekend, including the opening of "Steel Magnolias." The theater said it will re-open on Tuesday, Oct. 17, and carry on from there. Sonoma County Art Trails has been delayed one weekend because of the fires, moving to Oct. 21–22 and Oct. 28–29. The organizers of the county-wide self-guided art studios tour cited a desire to keep cars off the road in consideration of first responders. The Sebastopol Center for the Arts will remain open with a preview exhibit. Also in Sebastopol, Main Stage West is delaying the opening of its world premiere production of "Mary Shelley's Body," written by Bohemian contributor David Templeton, until Oct. 19. In Rohnert Park, the Green Music Center has cancelled its event with Garrison Keillor tonight and will remain closed through the weekend as directed by Sonoma State University, who closed the entire campus yesterday until further notice. Cotati has also cancelled the Cotati Oktoberfest scheduled for Oct. 14, and Redwood Cafe is canceling shows tonight and Sunday, though Saturday's show with Midnight Sun Massive is still on and will act as a musical sanctuary space according to the venue. In Petaluma, the Mystic Theater has been operating as a daytime evacuation center, though this weekend's concert with New York rock-fusion band TAUK has been cancelled. In addition, The Tolay Fall Festival announced it will not be held Oct. 14-15 in southeast Petaluma. In Sonoma, Gundlach Bundschu Winery's concert on Oct. 16 with English rocker Spiritualized has been moved to the Terrapin Crossroads in San Rafael. In addition, the Sonoma Valley Museum of Art's opening reception for David Ligare's "Magna Fide (The Great Belief)," originally scheduled for Oct. 14, will be postponed to Oct. 18. Sonoma Arts Live has also delayed the opening of it's production of "The Rainmaker," a drama about a Depression-era town fraught with drought, to Oct. 19. In Glen Ellen, the Wine Country Ragtime Festival at Jack London State Park has been postponed, and Quarryhill Botanical Garden has cancelled its lecture with author Andrea Wulf tonight. Many other Sonoma Valley venues remain closed as flames continue to move through the area and evacuation orders stay in place. In Napa, the Blue Note Jazz Club and JaM Cellars Ballroom, both located within the Napa Valley Opera House, announced they will be closed until Nov. 5. The Uptown Theatre has cancelled tonight's "Take Me to the River" Blues and R&B revue and rescheduled Boz Scaggs' shows from Oct.19 and 20 to April. Silo's nightclub is closed through the weekend. Napa theater company Lucky Penny Productions is delaying the opening of it's production of "The Crucible" to Oct. 27. The CIA at Copia has cancelled its inaugural Oktoberfest, scheduled for Oct. 14, and in Yountville, the Lincoln Theater has cancelled its two performances this weekend. In addition, the entire town of Calistoga is still under mandatory evacuation, and many Napa Valley wineries and businesses remain closed due to ongoing fire conditions. The list of closures and cancellations goes on. If you have plans at all in the North Bay this weekend, double-check with the event venues or organizer for information.